Slaughtneil's Christopher 'Sammy' Bradley has had another brilliant campaign Picture Margaret McLaughlin. IN the crucial quarter-final the Shamrocks had targeted the Slaughtneil kick outs by limiting the runs of their potential ball recipients but when Ballinderry were reduced to thirteen players the opportunities for the Emmet’s netminder increased as he could play the ball into space and from there Slaughtneil built successfully from there. In the final McMullan could target his kick outs with relative ease. He demonstrated his shot-stopping ability when he saved a Benny Heron penalty in the 35th minute. A class act. 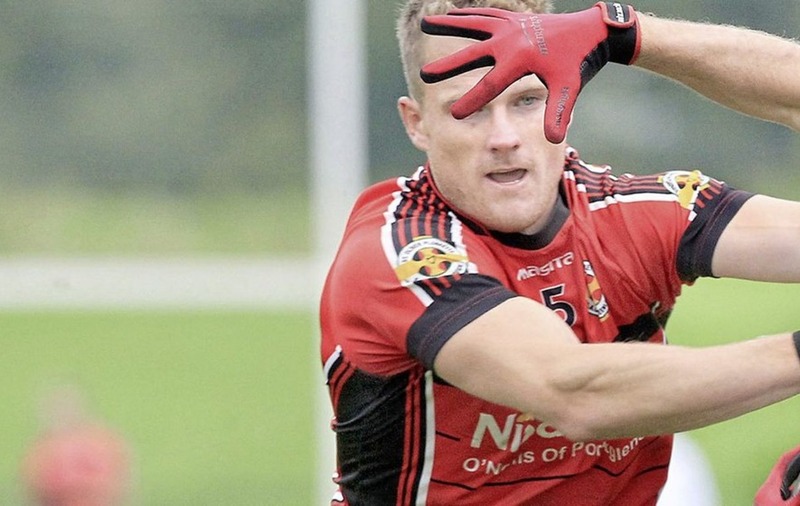 IN his four games in this year’s championship the former inter-county defensive star was listed at right half back, full back, left half back and in the final again with the number three on his jersey. But really, he played all over the field wherever his defensive skills were required, especially in the semi-final where he kept a tight rein in the closing minutes on Enda Lynn. In the final despite an early yellow card he tried hard to limit a rampant Slaughtneil attack. 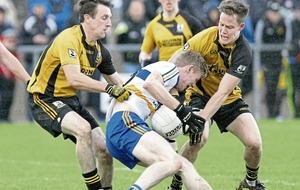 AS expected the inter-county star was delegated the role of trying to shackle the key player on the Ballinascreen team Benny Heron and for the most part it was a riveting contest, Rogers often finding time to drive deep into Ballinascreen territory. It has been a facet of his play from the first game against neighbours Swatragh right through the campaign, his surging runs from deep repeatedly creating space and scoring opportunities. A wonderfully athletic player who lit up the championship. In the 2016 campaign he was in the Derry team of the championship, described as arguably the best player of the championship. Once again, he makes the fifteen with consummate ease, his sheer class demonstrated twice in the opening five minutes with two timely interceptions. As has been his hallmark throughout the championship campaign he has shown composure and awareness in the defensive zone, giving calm protection to his keeper, a truly class player who has had a stellar championship campaign. IN a semi-final game that was eventually decided by an awkward bounce of the ball in Ballinascreen’s favour, a match where very few players stood out as a game breaker the difference overall was the quality with which the teams broke from defence and the ‘Screen defender gave them a steady supply of the ball to secure victory. In the opening round, he started at midfield but as Ballinascreen rotated their players he moved inside and finished with 0-3. He held a high line in the final. IN the 11th minute a surging run up the left wing from the three times championship captain Francis McEldowney was the catalyst for the goal that Ballinascreen could not afford to concede so early in the game. McKaigue was then in the right place to take a pass from Rogers and blast to the net for 1-4 to 0-2, and as he had done all season, he was composed and authoritative in defence, and supportive in attack with an assist for a Shane McGuigan goal. 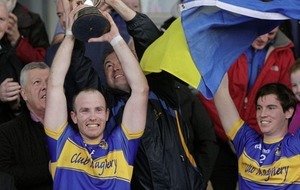 IT has been a memorable year for the indefatigable captain of the last three championship winning campaigns. 2017 was his 7th senior championship final, the final whistle at Celtic Park heralding a 5th John McLaughlin Cup medal. Indeed, he could also have been the winning captain for a fourth successive year but most sportingly and unselfishly, and entirely in keeping with the team ethic, he stood down, allowing the mantle of captaincy to passed to the great Patsy Bradley. With all this he also had a fine season in a new defensive role! LIKE his compadres Francis McEldowney, Paul Bradley and Barry McGuigan on the Emmet’s team he has played in seven senior championship finals and won five championship medals. Over the three winning campaigns he has been the ‘heartbeat’ of the team and once again he defied injury concerns to line out at midfield and give an inspirational performance. It was fitting that he was the Slaughtneil player to receive the John McLaughlin Cup as they equalled Bellaghy’s four in a row team. HE has had a phenomenal championship campaign, the driving force that propelled Ballinascreen to final through his phenomenal work-rate and scoring prowess that yielded 3-6 in the three games to the final. Against the fancied Coleraine his mesmerising attacking display crushed Owen Roes in the opening quarter as he scored a goal and set up Dermot McBride for another. ‘SAMMY’ was truly magnificent, a majestic performance bringing him ever so close to a man of the accolade. But really, he has been at the top of his game right from the Swatragh game when he set up the first goal and then put the icing on the cake with a late penalty goal. In the opening half, he tormented Ballinascreen and scored 0-03, late in the second half he won a penalty but was then denied by a brilliant Niall McGlade save. He is back to his swashbuckling best. 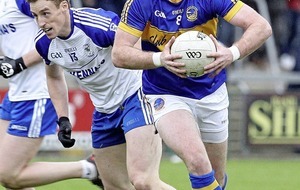 THROUGHOUT the four-match championship campaign the Tyrone native had been the ‘go to’ player when a score was needed whether from open play or frees. In the opening game he scored 0-5, just 0-2 from frees, grabbing 1-4 in the demolition of Coleraine, then running up another 0-5 haul in the tight semi-final against Greenlough. In the final when scores were at a premium against a rampant Emmet’s he converted four frees for an impressive 1-18 tally. IT was felt that Greenlough might struggle to survive in Division One but, with the help of Lynn when available they achieved that goal. In the opening round of the championship he scored 0-3 as Greenlough caused a significant shock by beating Glenullin. 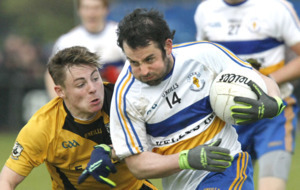 He followed that with a match-winning 0-7 in a thrilling win over Banagher to help his club reach their first ever senior championship semi-final. He was not as influential against Ballinascreen but overall had an excellent championship season. FROM the moment, he scored Slaughtneil’s second goal in the 22nd there was little doubt that he would end up with the Player of the Match Award, although he was pushed all the way by Christopher Bradley and Chrissy McKaigue. He started this game with 1-11 but when the final whistle sounded he had racked up 2-4 to finish the competition as the championship top scorer with 3-15. He was in scintillating form in all four games. HE has been an integral part of the Slaughtneil attacking unit all season, the focal point of the front line as they progressed through the championship minefield. In the opening round he landed a point, following up with a decisive late goal against Ballinderry and three points against Glen. In the final he grabbed a point and set up his cousin for the fourth goal in the 40th minute. A composed player throughout the season. HE set the tone for a magnificent display against Glenullin in the opening round with a 3rd minute goal as Greenlough raced to a 2-6 to 0-4 lead by the 20th minute, dropping deep in the final quarter as the Mitchel’s came strongly. He was also very much to the fore with 1-2 in the second round against Banagher as a first ever SFC semi-final place was gained. He capped a superb championship season with 0-5 against Ballinascreen.